YORKVILLE, Ohio, Oct. 27, 2016 /Christian Newswire/ -- This years Extraordinary People Award for Christian Duo of the Year went to the Chrisagis Brothers, who are becoming known world-wide. The awards were voted on by 200 countries and the Brothers are in great demand, within the past few weeks they have been scheduled to do concerts in Florida, Texas, New York, and even Pakistan (which had to be done through Skype). They are also booked before the year is over in North Carolina, South Carolina, Georgia, Pennsylvania, West Virginia, and Ohio. For Christmas the Chrisagis Brothers will be in concert Dec. 3rd with Russ Taff, the iconic legendary male vocalist who won six Grammy Awards, 11 Dove Awards, and has been inducted into the Christian Music Hall of Fame. 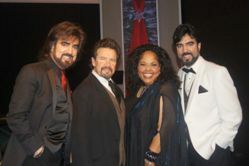 Also scheduled to minister in song is the acclaimed Gaither vocalist Angela Primm, who is one of Christian music's most popular females of the era. Angela is the most explosive, energetic, spirited artist you will ever find. Putting the four together in one concert will be a blessing for all. The Dec. 3rd concert is at Journey By Grace Church at 4803 PA 51 Belle Vernon, PA 15012 AT 6:30 p.m. The Brothers are also excited that they will be traveling Dec. 12-14th with one of their greatest inspirations in ministry the legendary Christian music pioneer Scott Wesley Brown. The Brothers call Scott one of the most anointed generals in God's Army. They will be guests on Watchmen Broadcasting TV Network on Dec. 12-13th with Brown. Then on Dec. 14th they will be on the Dove Network TV series Nite Line. If that wasn't enough they have teamed up with Prison Fellowship International to help children world-wide. The Brothers also have been doing a Christian Radio Show every week for Wilkins Radio, called It's A God Thing. They have interviewed famous guests such as Christian Music's Sweetheart Evie Tornquist, actress Jo Ann Pflug, director Kevin Mcafee, and iconic TV and film star Corbin Bernsen, among others. The Brothers say in the new year they have some major super stars lined up from iconic TV shows and award winning films.